The LS042150A4FWA000 is a commercial quality 4-way active splitter that meets strict level and match specifications achieved through the use of Quintech’s proprietary microstrip and SMT technology. 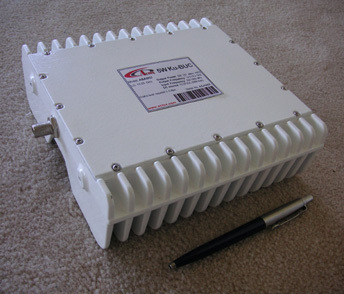 It operates over the 950-2150 MHz frequency range and permits signal splitting with zero loss, eliminating the need for external distribution amplifiers. Internal circuitry has been incorporated into the LS042150A4FWA000 to allow parallel connection of 2 DC power sources for redundancy. The front panel includes 3 LEDs which indicate the current power status of the unit, along with a 2-amp fuse for each power input. The green LED labeled “POWER” will light if either power source is functional. If power source #1 fails, the red LED labeled P-1 will light. If power source #2 fails, the red LED labeled P-2 will light. If both power sources are operational, neither P-1 nor P-2 will light (see LNB power specification below). Note: Note that power is present at each input at all times. All unused RF output ports must have 75 Щ terminations. If an input is being terminated, a DC block must be inserted prior to termination.